Outsource2india is a leading call center outsourcing services provider, offering a wide array of highly cost-efficient and reliable call center solutions to reputed companies across the globe. Having worked with numerous clients for almost a decade and half, we have experienced that the most common question every client seeks answer for is, "what is the total number of agents and budget I require to support my desired service level?" How many call center resources will I need to support my call center expansion requirements? What will be the cost incurred for the desired service level? 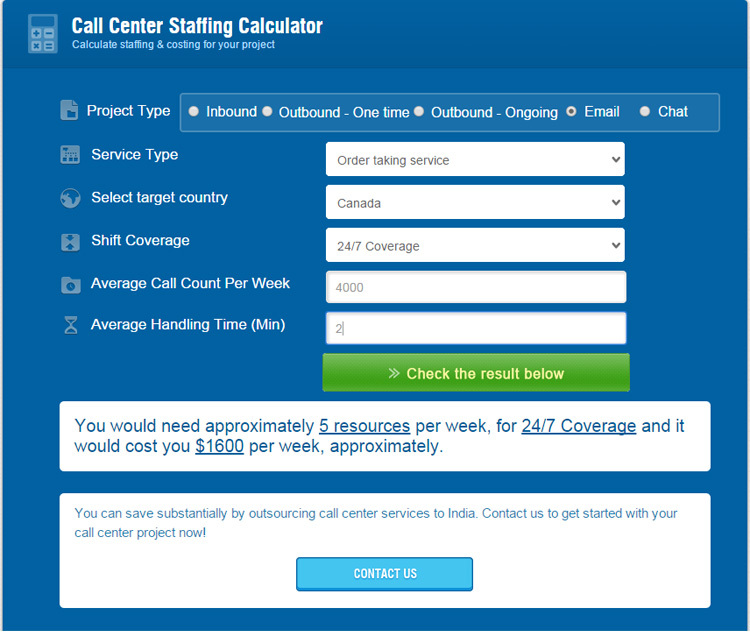 Call Center FTE calculator from Outsource2india is ABSOLUTELY FREE, and establishes the required number of agents and cost incurred per week, once the user inputs his project and service type, target country, call count, average handling type, and shift coverage preferences. It offers a list of services for which a user can know his/her staffing requirements. These services vary for different project types. You need to enter the total number of calls (numeric field) that are to me made per week to the customers. 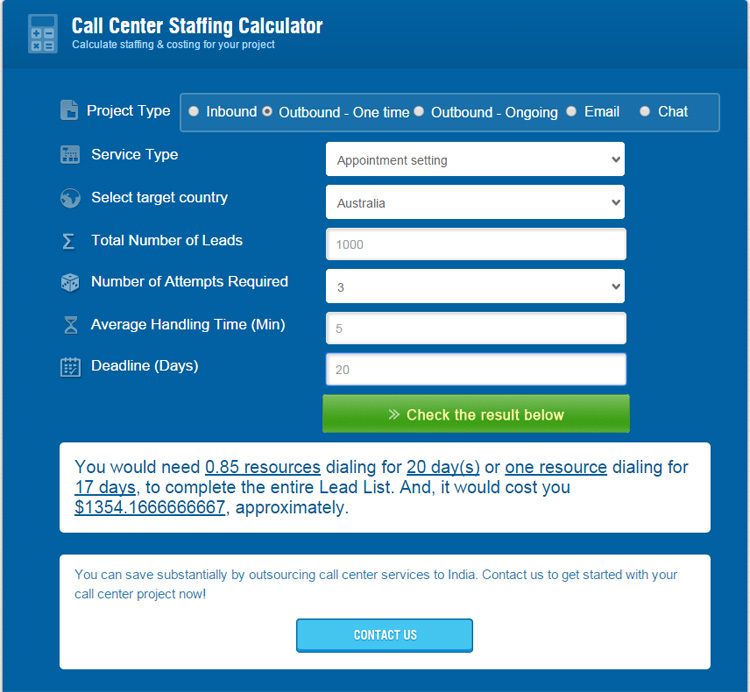 In this field, you need to enter the minimum time a call center executive needs to spend on a call (numeric value in minutes). User needs to enter the total number of leads (prospects) to be called in the selected time-frame. User needs to select the maximum number of times the calling agent should try reaching the lead, in case he/she doesn't respond in the first attempt. The maximum number of attempts allowed is 5. 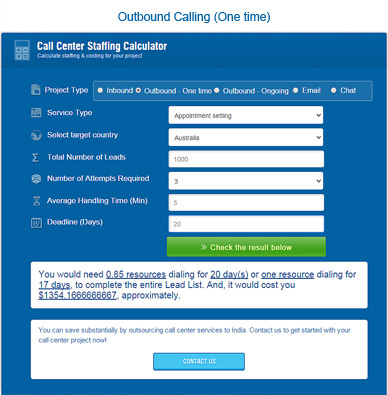 User needs to enter the total number of days in which he/she wants the agents to complete making outbound calls to all leads. As the name suggests, you need to choose the preferred calling method to be either manual or predictive. In case you are not sure, you can choose "Do not Know" option, which will provide you the rates for both. 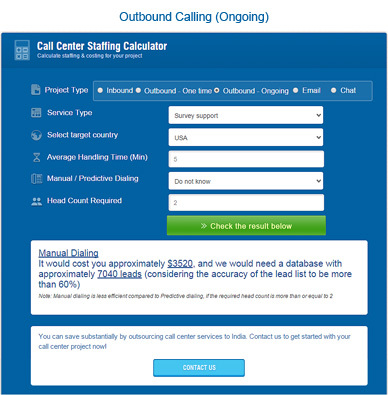 You need to enter the total number of agents working on your on-going outbound call center project. Calculate your call center staffing and budgetary requirements now. 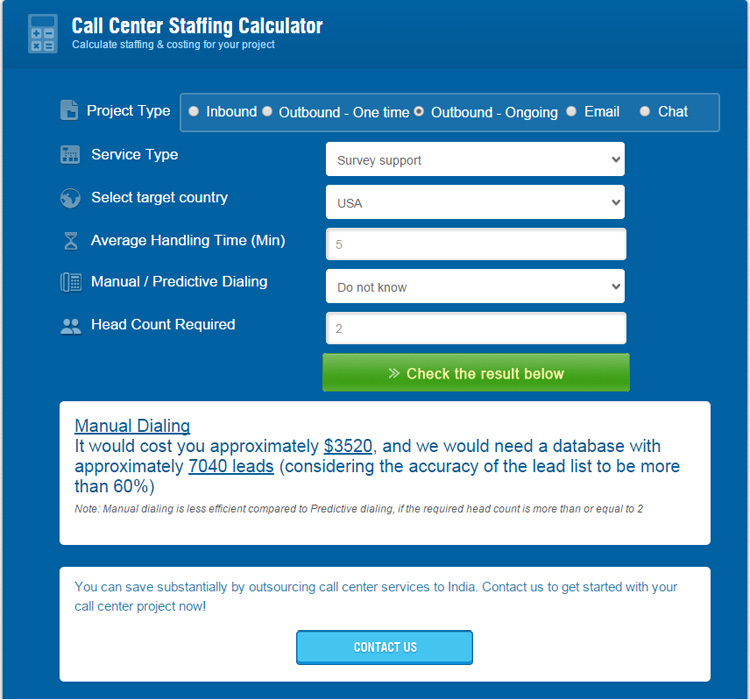 Hope this call center calculator help guide comes handy. 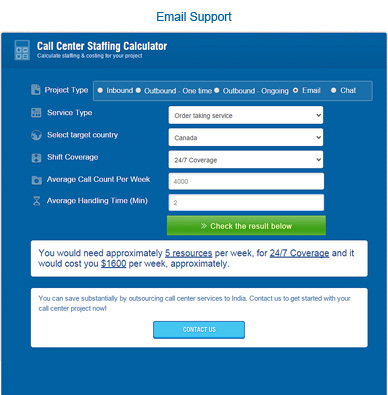 Contact our team to know how we can help streamline your call center operations in a cost-efficient way.